We have closed public access to the Molokai strategy. We don't want too many people using this strategy. 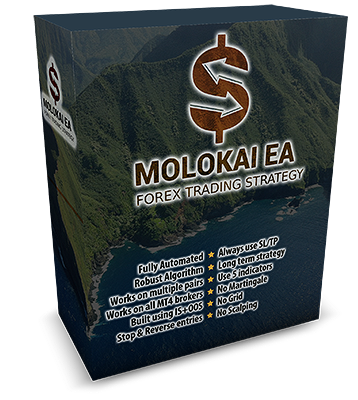 Molokai is a fully automated algorithmic trading strategy for MetaTrader 4 platform. It works on several currency pairs and doubled the account in 3 years already. 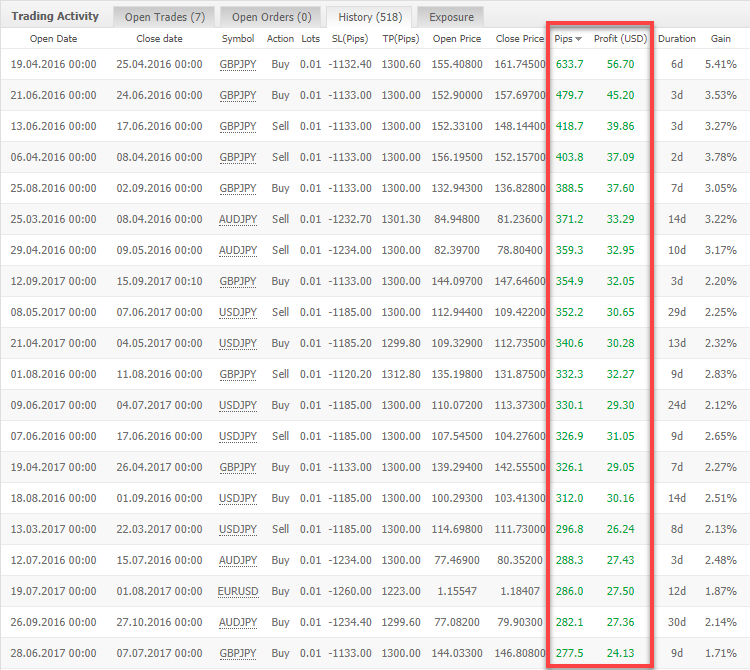 This Forex strategy is trading on my $1,000 USD demo account using micro lots (0.01 position size). Anyone can copy these trades to MT4 Live real money accounts. If you copy these trading signals from a demo to a live account, then your live account will profit for real when demo account grows. It does not matter if signals come from a demo or real account. What matters is if signals are winning. Important! Sometimes the strategy has BUY and SELL positions open at the same time for the same pair (hedge). On FIFO accounts (U.S. traders) the trade copier will skip hedge trades automatically without errors. 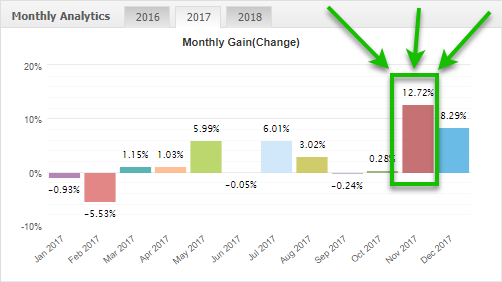 Best month in 2017 so far was +12.72% gain. 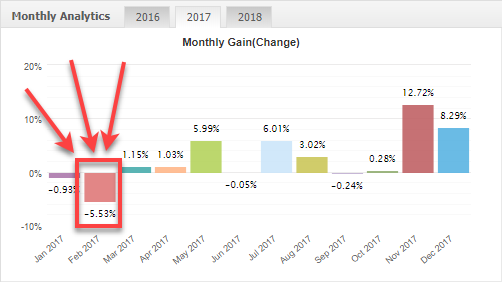 Worst month in 2017 so far was -5.53% loss. Four losing months and 8 winning months in 2017. 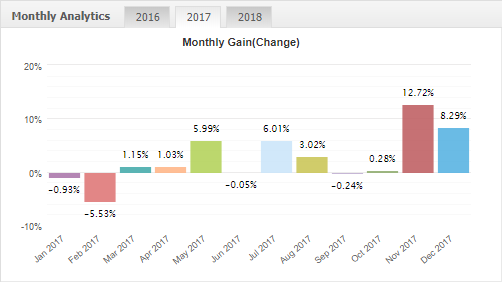 Best month in 2016 was +10.4% gain. 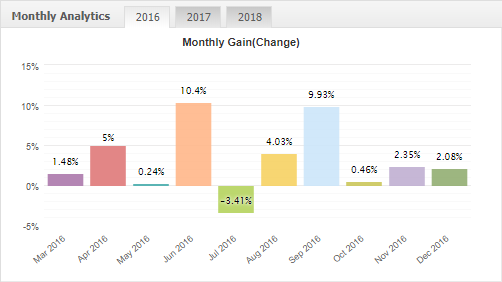 Worst month in 2016 was -3.41% loss. Only one losing month and 9 winning months in 2016. 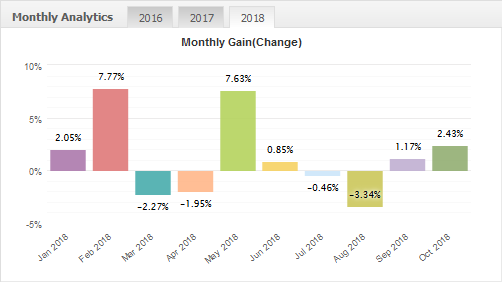 The largest winning trade so far since 2016 was +633 pips. Molokai EA uses dynamic take profit and when markets change there might be a new largest winner in the future. But so far there are lots of trades that gained more than 200 pips, 300 pips, and even more than 400 pips. The largest losing trade so far since 2016 was -326 pips. Molokai EA uses dynamic stop loss and when markets change there might be a new largest loss in the future. But so far only three losing trades lost more than 300 pips. Signup for Vavatrade to get read-only access to my MT4 accounts via investor password. Leave all MT4 accounts running on your computer or VPS server to copy the trades all the time 24 hours per day. Access to Vavatrade trading account(s) (order below). Local Trade Copier software to copy Forex trades between MetaTrader 4 accounts instantly. Computer with MT4 accounts open and LTC copier running 24 hours a day or a VPS server if you cannot leave your computer ON all the time. Once you order access to my MT4 accounts via investor password you can set them up on your computer and copy trades to your personal MT4 account(s) or accounts of your friends, family, and even your clients. Read this article for a step-by-step explanation how to install many MT4 terminals on the same computer from different or the same broker. Install my Forex trade copier following this installation video. Also, inside LTC package you'll find detailed instruction manuals. Then, watch this video which explains well how to copy trades from MT4 to multiple client accounts. You simply repeat the process with master MT4 account(s) you get from Vavatrade. By default, LTC copier software will copy the same size in % so for example, if you have a 5k account you will get 0.05 lot trades because it is 5 times bigger than my 1k account which is trading 0.01 lots. You, of course, have other options for risk management to choose from. And finally, I have lot more videos demonstrating how to copy trades between MT4 accounts if you'll need more. Important to note that I do not provide copy trading or trading signal services. I provide only access to my MT4 accounts that are growing thanks to my profitable trading strategies. Setup Signal Magician to send trading signals with automatic execution from Vavatrade MT4 accounts to MT4 accounts of your clients located anywhere in the world. Leave MT4 accounts from Vavatrade running on your computer or VPS server to send the trades all the time 24 hours per day. Clients will have to run Client EA on their MT4 all the time too. Perfect choice if you've always wanted to start your Forex Signal service. Signal Magician software to sell Forex trading signals to your clients. Computer with Vavatrade MT4 accounts open and Signal Magician Server EA running 24 hours a day or a VPS server if you cannot leave your computer ON all the time. Your clients will have to run Signal Magician Client EA to receive the trades. Once you order access to my MT4 accounts via investor password you can set them up on your computer and start selling trading signals to your clients using Signal Magician. It can be signals by SMS, Email and direct automated execution on client MetaTrader 4 accounts instantly. In this video I demonstrate how you can copy positions from MT4 accounts if you have just investor password (read-only) access. 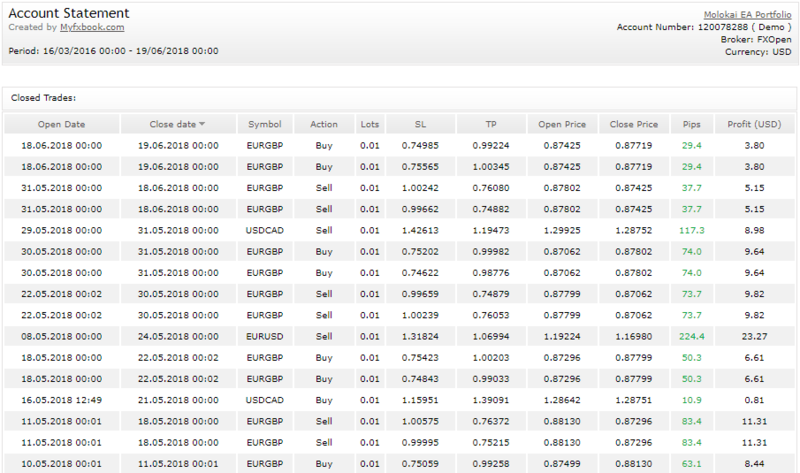 This is quite easy with my forex trade copier and this is how you can copy trading strategies from Vavatrade to your own trading account or accounts of your friends, family or clients.